Habitat Committee member Teresa Dolan of ESRI came up with idea to build doghouses, and auction them off as a fundraiser at Habitat’s “Journey of Hope” Gala. (Redlands, CA) Custom-built doghouses are just some of the items up for action at the Habitat for Humanity San Bernardino Area’s Journey of Hope Gala – Building Hope for Veterans on Friday, March 22nd from 5:30pm- 9:00pm at the University Hall in Redlands. Habitat Committee member Teresa Dolan of ESRI came up with idea to build doghouses, and auction them off as a fundraiser at Habitat’s “Journey of Hope” Gala. Habitat for Humanity’s Executive Director Dennis Baxter and its board of directors thought that it was a splendid idea. 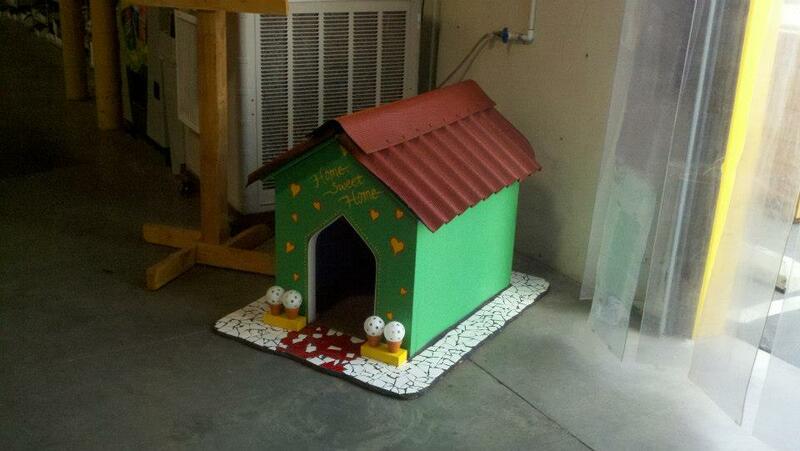 Dolan also made and delivered the first of three doghouses available for auction. Photos of the doghouses can be seen on Habitat for Humanity San Bernardino Area’s Facebook page at www.Facebook.com/habitatsb. “Funds from the gala supports Habitat for Humanity’s goal of working in partnership with families to eradicate substandard, poverty housing, strengthen communities and transform lives by building new homes, rehabilitating existing homes, and making affordable home ownership a reality for community members in need,” said Baxter. Funds will also be used to increase rehabilitation and home building of for San Bernardino area Veterans, said Baxter. Habitat for Humanity San Bernardino Area has built 28 homes since its founding in 1992. According to Baxter, too many veterans have been left homeless by the economic recession, this together with difficulties many soldiers suffer as they return from deployments in Afghanistan and Iraq have really hurt their ability to keep or buy a home for their families. “Building Hope for Veterans” uses Habitat for Humanity’s proven low-income home buyer tools to make Veteran’s housing affordable. The Habitat model has approved homebuyers that provide 500 hours of work in the construction or rehabilitation of their homes. Our interest free financing make mortgage payments under $500 a month, ensuring that families can keep their homes,” said Baxter. Fifth District Supervisor, Josie Gonzales is the keynote speaker for Journey of Hope Gala and San Bernardino Mayor and Habitat for Humanity San Bernardino Area founding board member Mayor Pat Morris is the master of ceremonies. Live entertainment for the Gala is provided by The Overeasy, a band dedicated to the groove. Born at the University of Redlands, The Overeasy has been grooving since May of 2009. Drawing from musical styles ranging from rock to funk, they incorporate these influences to produce uniquely original music. The San Bernardino Area affiliate serves the communities of Redlands, Loma Linda, Fontana, San Bernardino, Highland, Yucaipa, Colton, Bloomington, Rialto, Grand Terrace, Mentone, Running Springs, Lake Arrowhead, Hesperia, Apple Valley and Victorville. Tickets for the event are $75 per person, $125 a couple and $500 for a table of eight. Top Achievements Of Habitat For Humanity San Bernardino Area, Inc. Rehabilitation of Home for Habitat Family in partnership with the City of Yucaipa and Kivett-Teeters Real Estate, Inc.
Critical repair of home belonging to a Veteran in Partnership with the Home Depot Foundation. Eleven “Brush with Kindness” projects resulting in the painting/facelift of 11 homes in Fontana. Partnered with the “Inland Caregiver Resource Center” on the installation of three handicapped ramps for a senior citizen in the City of San Bernardino. Opened a 24-thousand square foot home improvement retail location open to the public called the ReStore, under Habitat for Humanity International guidelines. Partnered with the City of Grand Terrace and The San Manuel Band of Mission Indians Community Outreach on preparation for two Habitat “Builds” within the City. Engineering plans, soils investigation, architectural renderings, publication notice and topographic surveys accomplished. Four buildable lots in the City of San Bernardino previously donated by the Baker Estate. Engineering plans, topographic survey, and soil investigation completed. Six Families chosen by our “Family Selection Committee” for four builds in San Bernardino and two in Grand Terrace. We have recently been approved to participate in the National Community Stabilization Trust program. “NCST” facilitates the transfer of foreclosed and abandoned properties from financial institutions to housing organizations to promote productive property reuse and neighborhood stability. Electronic recycling in partnership with “ALL Green”. Ongoing project to keep electronic waste from going into landfills. Over 60-thousand pounds recycled in the last year alone. Active participation in the “Cars for Homes” program in which automobiles are donated to Habitat for Humanity, recycled with funds going to HFH San Bernardino Area, Inc.
Partnered with “Grid Alternatives” to provide and install solar panels for Habitat Homeowners at no charge with the goal of lowering energy costs for the Homeowner. Succeeded in receiving funding for a new Box truck from the Weingart Foundation.